DJ Culture in the Mix (Bloomsbury, 2013) edited by Bernardo Attias, Anna Gavans and Hilegonda Rietveld is a book that explores, in its own unique way, the ever-changing landscape of DJ culture, particularly in the genre known as electronic dance music (EDM). The book focuses on the DJ specifically as an artist. This approach is much-needed in a time when the DJ has become ubiquitous in the mainstream. The book's critical framework also invites the reader to reflect on the act of cutting and mixing on digital decks and turntables as an art form, which has experienced ongoing creative expansion due to the constant development of new technology used, not only to repurpose music and to create new compositions, but also to share it and perform it. 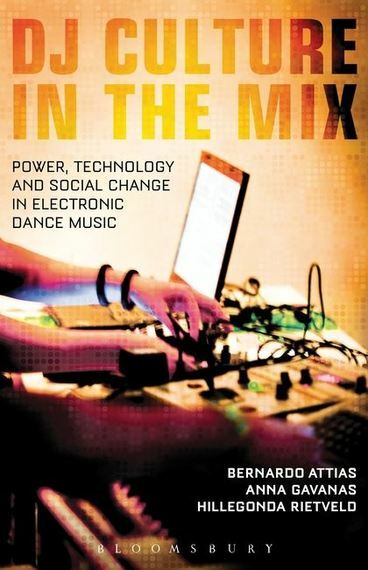 Some of the text also focuses on cultural tensions in relation to gender, ethnicity and the act of DJ-ing. Instead of doing a straight forward review of the book, I found it worthwhile to interview extensively one of the editors. In what follows, Bernardo Attias kindly explains the process of editing the book, while also sharing personal reflections on what it means to be a DJ scholar and practitioner. E. Navas: Please share how the book theme came about. What was the process of collaboration among the three co-editors? B. Attias: The three of us met at a conference in Kingston in 2008. At the time, Anna Gavanas had been working on a proposal for a book to be called International DJ Bums that really stressed the international theme. She and I began collaborating, and we got in touch with Graham St. John at Dancecult: Journal of Electronic Dance Music Culture. Through this connection, we decided to pursue a special issue of the journal devoted to DJ culture. This became our focus for the next couple of years, and the result was the 2011 special edition, which Anna and I guest edited. This experience inspired us to explore some ideas that hadn't made it into the journal, and we wanted to pursue these issues in a format that didn't have the same limitations as a journal special issue. We had also wanted to work with Hillegonda Rietveld for some time. We had approached her while working on the journal -- so when she agreed to join forces with us on an edited collection, the project took on new life for all of us. Honestly my biggest surprise was how smoothly the work went. With the three of us spread out geographically and with very busy lives quite apart from the book, the potential for disaster seemed strong. With so much being done over email and Skype, possibilities for miscommunication abounded. While there were certainly occasional hiccups, most of the work proceeded smoothly because of the bond of friendship and common purpose that we developed through the process. Bernardo Attias interviewed in the TV program CSUN On Point, April 2013. EN: The book presents an international context for Electronic Dance Music (EDM): How did you select the essays included? Did the editors have particular parts of the world in mind? BA: We were fortunate to receive essays from various parts of the world, many of which took quite interesting approaches to DJ culture. We had pitched the call for participation internationally, but I don't recall us making any special efforts to engage particular parts of the world. In hindsight, this is something we could have done more deliberately: We wound up with an interesting spread of contributors internationally, who described music scenes in New York, London, Stockholm, Sydney and Sao Paolo, but I wonder what the project might have looked like had we specifically solicited accounts of scenes that have emerged in the Middle East, Ukraine, Mexico City, Johannesburg, Buenos Aires, former Yugoslavia, as well as long established scenes of historical significance such as those in Chicago, Berlin, Detroit, Manchester, etc. Ultimately, however, that would have been a very different book -- our biggest concern when we started soliciting chapters was that the focus of essays be on DJ culture (rather than about electronic dance music per se, or about particular music scenes generally). We wanted an international mix of contributions, but the primary focus had to be the figure of the DJ. EN: How has editing a book on dance culture changed or not your relation to electronic music? BA: Well, I wouldn't say it has changed it that much. Sometimes I wonder if I intellectualize music too often, rather than kicking back and enjoying it -- there's certainly a tendency to treat every festival or event as an artifact for analysis -- but I feel that is the plight of the intellectual generally; I'd probably experience that whether or not I'd published on this topic. There's a great article by Alice O'Grady in Dancecult (5:1, 2013) that captures this sort of tension, specifically in terms of ethnographic research. I also appreciate all kinds of music, and I go through periods where I listen to a lot less electronic dance music (especially, for example, after spending several days at a festival). But I'm not sure that has impacted much by the book per se. EN: It appears that DJ culture is becoming an emerging field in academia. What do you think this means for EDM, and DJing as a creative act? Does an academic interest mean that DJ culture is entering a similar position as other music genres? BA: Well, certainly it's about time that DJ culture be taken seriously by scholars. There have been numerous scholarly works that discuss DJ culture before this -- Gonnie Rietveld has a great summary of most of the relevant literature in the introduction -- but the notion of "DJ culture studies" or something along those lines is a relatively recent phenomenon. DJ culture is interesting in that it is not a genre per se; it intersects numerous dance music genres including pop, reggae, hip hop, disco and numerous shades of rock 'n roll, as well as many other genres once you expand into radio DJs. And that's not even mentioning the huge world of "mobile" DJs who play weddings, private parties, etc. Electronic dance music has brought the DJ to international attention and significance as an artist, performer and cultural icon, but in some ways that focus only scratches the surface. EN: You are also a DJ, would you share your story with us? How did you evolve from a DJ to an academic? Was this something you kind of knew would happen? BA: I have always loved and been fascinated by music. As a child, I had a small tape recorder that I kept next to my transistor radio so I could push "record" when songs I liked came on. I treasured these tapes even though I often missed the beginning of songs, [or] had announcers talking over them. I think I learned early on to appreciate the fragmented nature of the musical text. Eventually, I started experimenting with these, pulling out the magnetic tape from these cassettes and cutting it up and putting it back together in different orders -- creating strange juxtapositions of sounds and music. I had no idea what I was doing at the time, but the practice mirrors what William S. Burroughs and Brion Gysin developed as a literary technique: Cutting and pasting sounds and texts in order to create surprising new combinations. I think this always influenced my approach to music and DJ-ing. The first time I DJ'd a party, I had little in the way of equipment, and less in terms of expertise. I used a belt-drive turntable, a cheap 4-channel mixer from Radio Shack and a cassette deck, alternating between vinyl records and cassettes. It wasn't until I attended university that I had my first experience with the legendary Technics 1200 turntables, and this was on the radio station rather than in clubs. Eventually I found myself DJ-ing in small dance clubs; this was Chicago in the late 1980s. While I didn't play warehouses and raves at the time, I was heavily influenced by the rave phenomenon that was developing around me -- we didn't know it at the time, but my friends and I were witnessing the beginning of a major shift in popular music with the birth and spread of house music and techno. As a DJ I was always eclectic -- perhaps too eclectic to ever succeed among mainstream audiences. When I was playing clubs more actively in Los Angeles in the early 2000s I had a hard time marketing myself because most of the DJs around identified themselves strictly with specific genres -- the hip-hop DJ, the progressive house DJ, the pop DJ, the drum 'n bass DJ, etc. I tended to favor gigs that allowed me the freedom to move between various genres, and such gigs were few and far between (especially in the pop and hip-hop-heavy club environment in Los Angeles). For me there was no evolution from DJ to academic -- I didn't know it in college, but I was always an academic as well as a DJ. I intellectualized everything (for better or for worse), and I was constantly trying to think and talk about things in a deeper context. In the summer of 1989, I prepared myself for graduate school by DJ-ing in a club that favored Chicago's industrial music and attending acid house parties weekly. I had a day job in a record store, and I often got together with friends for recording sessions; my life (for a few months, at least) focused entirely on music. So, it was natural that I imagined myself writing about music as an academic. In graduate school, my first papers were about music (I wrote a history of acid house music and a textual analysis of the Velvet Underground's first album in my first couple of years) and I imagined that my dissertation would focus on house music. The 1991 U.S.-led war against Saddam Hussein's Iraq caught my focus, however, and I wound up writing about the media coverage of the Gulf War to finish my Ph.D. But my obsession with music continued, and when I moved to Los Angeles to work at CSUN, I began DJing at clubs out here, and I was invigorated by the changes in musical culture that I witnessed throughout the 1990s and early 2000s. Entire genres of music had developed through innovations in technology and sound. There was incredible energy and inspiration involved in the sonic cultures that were emerging at the time. EN: In terms of DJing rising as a valid creative activity, how do you relate to the act of remixing? Looking back at history, it appears that it is a sort of bridge to producing original content by DJs. Is this what most DJs who want to be professionals in EDM aspire to or are expected to do, in your opinion? BA: I think the notion of the "remix" goes far beyond the DJ and music, and it's exciting to see the notion used in academic work on literature, media, art, etc. The idea of "remix culture" is, to me, much bigger than remixing popular songs, for example. To get at your question, however, yes I think it has become expected that for any electronic dance DJ to "make it" as a big name, they must remix popular songs, and be a producer in their own right. And the reverse is true for better or for worse -- a producer who makes it big must prepare to be ridiculed for their lack of DJ skills when they inevitably are asked to play CDs at a club, despite the fact that they've never done it before. I'm not sure these expectations are a good thing, but, to be honest, I don't think it much affects the artists I'm most interested in -- I've always been more committed to the underground, where creative freedom is more common. Many underground DJs aspire to production as well, of course, but I'm more likely moved by productions of artists who are motivated to express themselves than by those who are doing it because that's what's expected of a pop star in this day and age. EN: What do you think comes next to DJ culture now that DJ-ing is considered a valid creative act? BA: Well, it's been considered such since at least the 1980s when hip-hop artists began to show the world what could be done with the vinyl record as an instrument itself. So, in a way, we've been there for a long time now. In some ways, the immense popularity of DJs over the past decade or so has turned it not into a "valid creative act" so much as a celebrity cult. [The fact that] you see articles in Forbes about the top millionaire DJs, or editorials in the Wall Street Journal focused on the incredible popularity of electronic dance music suggests that it's gone way beyond simply legitimizing the arts. I don't think the commercial success of DJ culture is a bad thing per se, but I do think that the creativity of DJ-ing can get lost in the culture of celebrity. We're at a stage when celebrities with no DJ experience at all can become extremely successful DJs simply by announcing that they are. Paris Hilton, Pauly D -- they were selling out large DJ venues based purely on their cache as TV celebrities, rather than any musical talents. I think scholars and fans will continue to look to the underground for new ideas and musical expressions. I do worry about the increasing balkanization of musical genres, especially coupled with the expectations that DJs commit themselves to this or that particular niche within dance music, but I think there will still be far more interesting things going on in those niches than there will among the DJs represented in the Forbes "Top Ten," for example. I also think that scholarship is directing our attention more and more to gender and race in DJ culture in ways that will prove influential in the long run. We've already seen a number of documentaries focused on women in DJ culture, and Rebekah Farrugia's study "Beyond the Dance Floor" has helped lead the way for scholars in the area. I hope to see the attention to this issue go beyond the inevitable tokenization that occurs with overly eroticized "women-DJs-only" DJ events with names like "Chicks with Decks." Such events can be helpful, but not when the big mainstream festivals routinely ignore or sideline women performers. And in terms of race, I think some interesting work is being done to historicize the function of race in DJ culture -- its emergence among African Americans in New York, its influence on Mexican dance music, its popularity among Filipino youth, etc. -- although certainly more work needs to be done in this area. I'm particularly interested in the ways in which the cultural hybridity of DJ culture and of dance music, generally, sometimes functions rhetorically to cover over homogenization in the music and the commercial culture. Whatever the future holds, however, one can be certain that there will be more surprises around the corner both in the music and the scholarship!